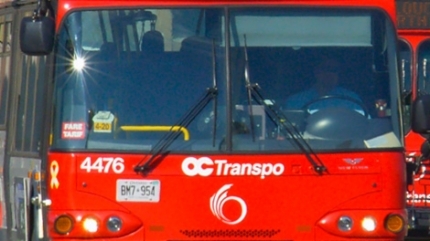 Each bus in Ottawa has a four digit number that identifies it (like 4476 above). One thing to do while riding, if you don't have a bus transfer to play with, is to pass the time factoring that bus identifier (it's also printed on the inside of the bus, in case you miss it getting in). We all know some basic divisibility rules to help with factoring: If it ends in a zero, it's divisible by 10, if it's even then its divisible by 2, if it ends in a 5 then it's divisible by 5. You may know that if the last two digits of a number are divisible by 4 then the whole number is also divisible by 4 (because 100 is divisible by 4, so for example a number xy76 for any old xy will be divisible by 4 because xy76 = xy00 + 76, and both parts of the sum are divisible by 4). Digital roots help us with multiples of 3. If a number's digital root is 3, 6, or 9, then that number is divisible by 3. A digital root is easy to calculate: You just keep summing the digits of a number until you get a single digit answer - if your answer is not a single digit, you just do it again. For example, the digital root of 4476 is found by first calculating 4 + 4 + 7 + 6 = 21, and then 2 + 1 = 3. So 4476 is divisible by 3. So, we know 4476 is divisible by 4 and 3. Now if you can do some dividing in your head while sitting on the bus, you'll figure out that 4476/12 = 373. Now you might try a bunch of things to factor some more, but eventually you will decide that 373 is likely prime, and it is. So 4476 = (2^2)*3*373. I recently learned that you can also use the double digital root to help with factoring. The double digital root of a number is calculated by grouping the number's digits into pairs (starting from the right) and adding them, repeating until you get a double digit number. So 4476 gives 44 + 76 = 120, and then 1 + 20 gives 21. How can this be helpful? Just as the digital root of n is congruent to n mod 9, the double digital root of n is congruent to n mod 99. The digital root of n helps us identify multiples of 3: if the digital root of a number is equal to a multiple of 3 (3, 6, or 9) that means that the original number when divided by 9 has a remainder divisible by 3, which means the original number is divisible by 3 also. The double digital root can help us identify multiples of 11 in a similar way (since 99 is a multiple of 11). The rule is: if the double digital root is a multiple of 11, then so is the original number. So double digital roots help identify multiples of 11 that are multi-digit numbers (not always easy) by reducing the problem down to identifying multiples of 11 that are two digit numbers (which is easy). The double digital root of 4476 is 21, not a multiple of 11 (and we saw above that 4476 is not a multiple of 11 either). Lets try 1320: the double digital root is 13 + 20 = 33, which is divisible by 11, and it turns out that 1320 = 11 * 120. For another example, use this method to confirm that 3740 is also divisible by 11. To be honest, I have not been on an Ottawa bus whose number is a multiple of 11 yet, but if that exotically numbered public transport is out there, I'll know it when I see it.